Belgian Architect, Art Nouveau Designer of Hotel Tassel. One of the greatest architects of the late 19th century, the Belgian designer Victor Horta is best known for his Art Nouveau designwork, and ranks alongside Paul Hankar (1859-1901) and Henry van de Velde (1863-1957) as a pioneer of modern architecture in Belgium. His design for the Hotel Tassel in Brussels (1893-4), for instance, is seen by art critics as the first example of Art Nouveau being introduced into architecture from the decorative arts. As it was, the Tassel House became a manifesto for Art Nouveau - sometimes called Style des Vingt, in Belgium, after Les Vingt - and an iconic example of modern art, thanks to the use of revolutionary artistic, technological, and compositional elements. The use of iron, for instance, as a material for both construction and decoration, as part of an architectural program based on the open plan and the three-dimensional articulation of space, is Horta's unique contribution to the development of late 19th century architecture. Other important Brussels buildings designed by Horta include: the Hotel Winssingers (1895-6); the interior of the Hotel van Eetvelde (1895-8); La Maison du Peuple (1896-1898); Hotel Solvay (1895-1900); Dubois House (1901); the shop known as Magasins Waucquez (1903); Palais des Beaux-Arts (1928) and the Central Railway Station (1937). The French architect Hector Guimard (1867-1942) - noted for his Art Nouveau entrances to the Paris Metro (1898-1905) - was strongly influenced by Horta and promoted the "whiplash" style throughout Europe. After a stay in the United States (1916-19), Horta fell back on a more traditional and severe style which borrowed from classical Greek architecture. Born in Ghent, Horta attended the Department of Architecture at the Ghent Royal Academy of Fine Arts. In 1878, he went to Paris and worked for the architect Jules Debuysson in Montmartre, where he absorbed the fashionable styles of Impressionism and Pointillism, and was introduced to the architectural potential of materials like iron and glass. In 1880, following the death of his father, he returned to Belgium, where he enrolled at the Royal Academy of Fine Arts in Brussels. An excellent student, Horta joined the studio of his professor, Alphonse Balat (1819-95) official architect to King Leopold II. Together with Balat, Horta designed the Royal Greenhouses at Laeken, allocating an important design role for glass and iron. In 1884, his design for the Belgian parliament won the Prix Godecharle for Architectural Design; in the same year, on graduation from the Academy, he was awarded the Grand Prix for Architecture. Horta debuted in 1885 with a series of small houses that immediately displayed his talents. He also joined the Central Society of Belgian Architecture, and over the next few years entered numerous competitions for public commissions, winning several prizes. From the outset, his design approach was marked by a focus on lines and curves. In 1888, he joined the Freemasons, and networked actively, which later (from 1893) led to a regular supply of commissions for houses, shops and other commercial structures. In 1892 he joined the Faculty of Architecture at the Universite Libre de Bruxelles, and in 1893 was promoted to Professor of Architecture - a position he held until 1911. The turning point for Horta came in 1892, when he attended his first Art Nouveau exhibition. Inspired, he designed the first Art Nouveau-style building - the Hotel Tassel (1893-4) - employing a revolutionary open-plan floor layout, as well as a combination of structural features in iron and curvilinear botanical forms, later described as "biomorphic whiplash". Elaborate serpentine ornamentations in metal and glass were hidden behind a stone facade that merged happily with the more conventional houses alongside. 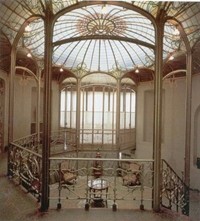 The same elaborate iron interiors were to reappear in numerous other designs by Horta, including his own house (1898-1902) - now the Horta Museum, Brussels. In this building, glass, wood and iron flow seamlessly around the glass roof above the main stairway. Curvilinear tendrils flow along columns and balustrades, complemented by delicate wall decorations and floor mosaics. In several of his buildings (such as the Hotel Tassel), Horta also introduced elements of Gothic architecture as well as Rococo decorations. Elected President of the Central Society of Belgian Architecture (1894-5), Horta spent the late 1890s designing and building the House of the People (Maison du Peuple), the headquarters of the progressive Belgian Workers' Party. The first building in Belgium to have a predominantly iron and glass facade, it housed a large complex of offices, meeting rooms, conference and concert hall with seating for an audience of 2,000 people. Its demolition in 1965 triggered a major scandal and a protest by more than 700 architects around the world. With the arrival of 20th century architecture, and after almost a decade of designing buildings and interiors in the Art Nouveau idiom, Horta turned gradually to simpler, less flamboyant style, and began to introduce motifs from Greek and Roman architecture, as exemplified by the marble columns which appeared in his extension to the Hotel van Eetvelde (1901). In 1906, he was awarded the commission for the new Brugmann University Hospital. Work began on Horta's unusual layout (low-rise pavilions spread over an 18-hectare campus) in 1911, although the onset of war delayed its opening until 1923. Another of Horta's delayed projects was the Tournai Museum of Fine Arts (1907-28), whose design incorporated an increasing number of classical elements borrowed from antiquity. In the immediate pre-war years (1910-13) Horta also began designing the Brussels-Central railway station - part of a much larger urban redevelopment program in the Belgian capital. However, due to the war, as well as numerous planning and building clearance problems, construction did not start until the late 1930s. In 1912 he became director of the Royal Academy of Arts in Brussels, a position he held until 1915. In February 1915 Horta travelled to London, where he attended an urban planning conference on the Reconstruction of Belgium, hosted by the International Garden Cities and Town Planning Association. Later in 1915, he went to the United States, where he lectured on modern architecture at MIT, as well as Cornell, Harvard and Yale universities, before taking up the post of Professor of Architecture at George Washington University. (See also: American Architecture 1600-present.) In 1919, he returned to Belgium, and was elected a full member of the Belgian Royal Academy. In the climate of post-war austerity, Art Nouveau was seen as too flippant and too expensive. In fact by this stage Horta had moved away from Art Nouveau and no longer employed biomorphic motifs in his architecture. Instead, he used classical elements as well as a more fashionable geometrical style, which underpinned a number of Continental avant-garde art movements such as the design group De Stijl (1917-31), Mondrian's Neo-Plasticism, Van Doesburg's Elementarism (1924-31) and the coming Art Deco (c.1925-40). One of his notable post-war designs was for the Palais des Beaux-Arts (1918-28), a multi-purpose cultural centre, which he designed using a simple and severe style that anticipated Art Deco, and which included motifs drawn from Cubism. The facade was made from stone cladding, but the basic structure was composed of reinforced concrete, while its egg-shaped Henry Leboeuf concert hall became known as one of the Worlds' greatest auditoriums. During the period 1927-31, Horta held the post of Director of the Brussels Royal Academy of Fine Arts, and in 1932 - in recognition of his services to art - was created a Baron by King Albert I of Belgium. Horta started work on this architectural project in 1910 but construction only started in 1937, before a further delay intervened due to the outbreak of World War II. Construction finally got underway in 1946 and it eventually opened in October 1952, although Horta did not live to see it. He passed away in 1947. Despite achieving significant success during his architectural career, Horta's reputation declined as public opinion shifted against Art Nouveau. Several of his buildings were seen as no more than collections of unnecessary decorations, and their exceptional spatial attributes were ignored. But after the demolition of La Maison du Peuple, in 1965, there was a radical improvement in the public's appreciation of his work. As well as his revolutionary iron and glass structural systems, he designed with great sensitivity, delicacy and beauty. Today, four of his buildings are listed as UNESCO World Heritage Sites. Influential Gothic style designer, medievalist. The "Dean of American architecture." Founder member of the first Chicago School of skyscraper architecture. Founder member of Vienna Secession. Pioneer of Prairie School architecture. German architect, influenced Gropius, Le Corbusier, Ludwig Mies Van der Rohe. 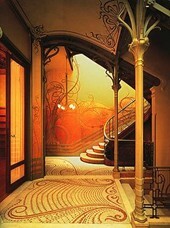  For more about Art Nouveau architectural design, see: Homepage.